Watch Young Carrie Underwood Sing "Broken Wing"
This video footage shows a young Carrie Underwood performing Martina McBride's "Broken Wing." Enjoy it here! Growing up in small town Oklahoma, the future country music superstar took every opportunity to hit the stage. 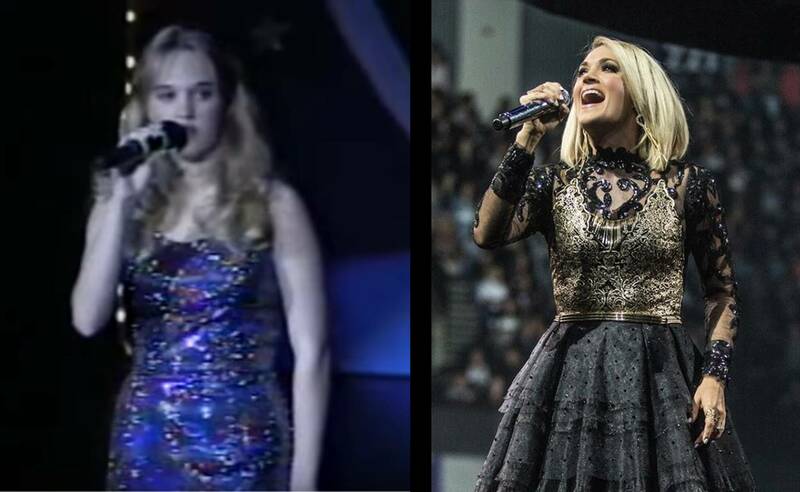 Young Carrie Underwood performed at the Robbins Memorial Talent Show, sang at her home church, and sang at community events such as Old Settler’s Day and the Lion’s Club. In 1998, at just 14-years-old, the budding artist performed Martina McBride’s “Broken Wing” at Arkansas’ Miss Westark Pageant. Enjoy the rare footage below! It’s amazing how mature her voice sounds as just a freshman in high school. What’s even more astounding is the fact that Carrie has never had professional voice lessons. Around this point in time, Carrie also traveled to Nashville and successfully auditioned for Capitol Records. As the label was drawing up a contract for the young talent, company management changed and the deal was dashed. Obviously, that disappointment was only a road bump in Carrie’s path to becoming one of country music’s elite performers. Earlier this month, she walked away with CMA Awards ‘Female Vocalist of the Year’ honor— for the fourth time. Share this throwback with other Carrie Underwood fans!